On warm fragrant mornings, not long after the sun rises out of the Atlantic, guests at the Two Meeting Street Inn in Charleston, can sit at one of the wrought iron tables on the veranda and drink coffee while the birds and butterflies help usher in a new day. In the painting, a butterfly tasting the petunias, draws the eye to a beautiful half round stained glass window. You can sense the chorus of songbirds just beyond the double-columned arches in the twisted old live oak tree which dominates the grounds. A brick sidewalk leads the eye through an arched gate in the wrought iron fence that defines the property, and across the famous Charleston Battery at the confluence of the Ashley and Cooper Rivers is visible through the trees draped with Spanish moss. 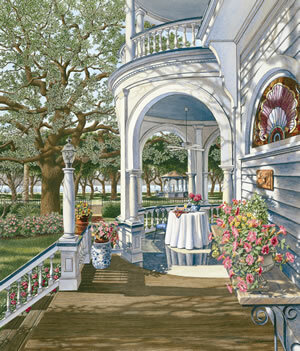 For "Morning Coffee" Dempsey has returned to the Two Meeting Street Inn, the same location as his most popular painting to date, "View From the Veranda". This view looks outward from a different angle and stands on its own as a beautiful and desirable painting. "Morning Coffee" is a sister piece to "Afternoon Tea" in size as well as palette. Plan your stay at Two Meeting Street Inn where Morning Coffee is served in the Victorian Dining Room or in the Southern Courtyard.